Welcome to my blog on this Spring Day! This is my last scheduled post for my DT position. I am busy packing to move in a few days. Then we come back to finish up and move my husband to his place, why?? Well he has to stay here and finish out his jobs, he is a Plumbing and Heating contractor and has houses started and the homeowners would not want him to quit. lol So sacrifices are being made for some months. The end result will be the family together in South Dakota before winter hits. We plan to travel back and forth for visits and he has to make some improvements on the new house too. I will be painting all the white walls, I love color and the walls and carpet are white so for now the walls will be painted. I am hoping to document the changes to our new house and life. We are stepping out of our world into the unknown and I am excited about it, new adventures await! Today is an new challenge at 7 Kids College Fund Challenge Blog our theme is ANYTHING GOES. I hope you can pop a card into the challenge for your chance to win $20.00 at the 7 Kids College Fund Store. 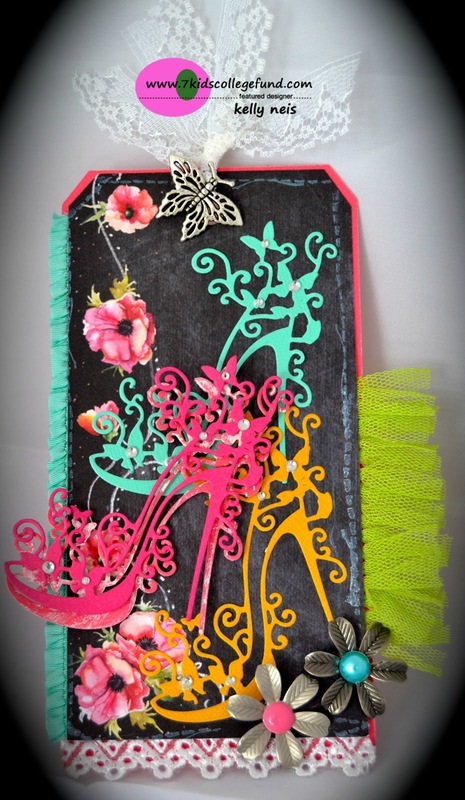 I used my pretty shoe die from Tattered Lace and created a colorful palette of shoes. "If you love the shoe, you must own one in every color you know!" a similar quote I found on Pinterest. I used Prima's optimist paper and added some trims to the tag. In the corner I used Prima mini mechanical flowers with a little Doodlebug sticker. A metal butterfly charm at the top also. Here is a 3D view of the fuscia colored shoe, I just made two and adhered it with pop up glue dots. The bottom one is distressed a bit with white paint. I think it added dimension and the contrast it needed. I also placed jewels on the butterflies for added sparkle. Thank you for stopping by today and don't forget to enter the new challenge at 7 Kids College Fund Challenge Blog. This is gorgeous Kelly. 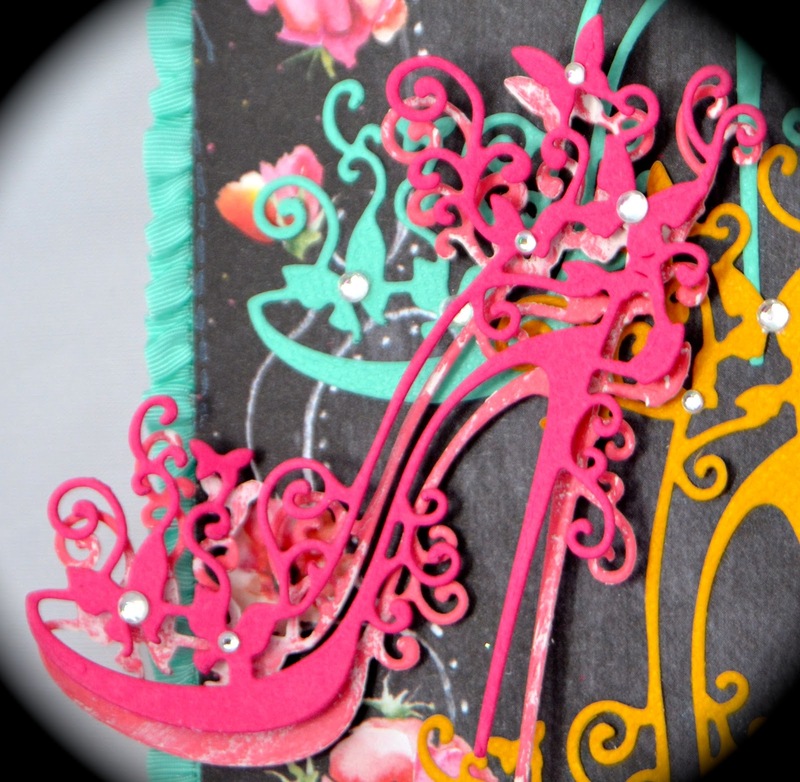 The shoe die is fabulous and love the design. I hope all goes well with the move and will look forward to seeing the changes in your new home. I don't see how in the world a woman can wear these kinds of shoes. Love your colors - you must be running around in circles. Fab creation Kelly and I love that shoe die... lots of glamour and glam. Good luck with the moving... it's a new start and fresh beginning. Lots of things to look forward to! Hello Kelly, well a lot going on in your life my dear! you'll certainly need something more comfortable in your feet than those highly feminine pumps!!!!! Although,my grandmother used to pain in high heels LOL I love love love your tag. I love shoes, and love the feminity about your creation. gorgeous bright happy colors, stunning on a black background. Well wish you all the best, in your new house. Hugs. I am SOOO excited for you!!! Makes me almost want to do it again too....SO NOT!!! ;) I can't wait to see the new adventure on your blog. :) Great things await you young lady and I'm so happy for you. Your creation is beautiful here. I'm not a heels type of gal, but I can appreciate a pretty shoe when I see one and these fit the bill. Somehow I almost missed this. Too much going on I guess. Anyway the colors are fantastic and I wish I could wear shoes like that. You've created a delightful tag Kelly! Wow - that's so cool - what amazing die-cuts!